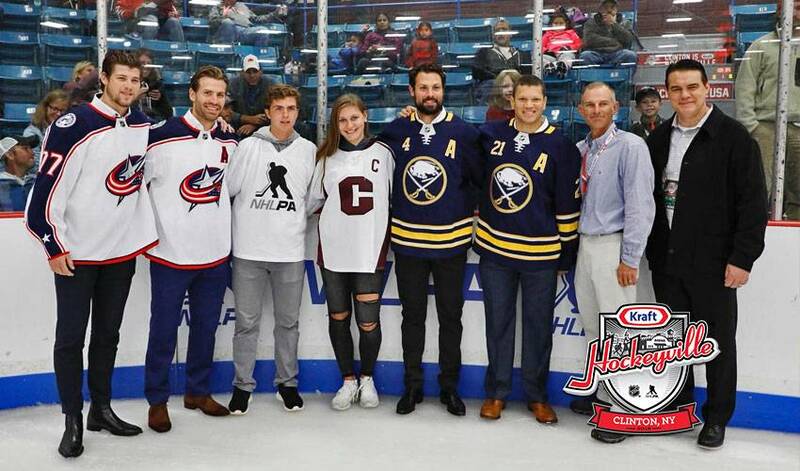 The upstate New York community played host to the Buffalo Sabres and Columbus Blue Jackets as the culmination of the Kraft Hockeyville USA 2018 festivities. What do you get when you combine history, hockey passion, an idyllic community setting and an exciting NHL pre-season game? Kraft Hockeyville USA 2018 in Clinton, New York. The love of both the game and community was on full-display this past weekend as Clinton became the centre of the USA hockey universe in celebration of the town being crowned Kraft Hockeyville USA 2018. The celebrations and events began over Friday and Saturday with a number of energetic and incredibly well-attended community events, topped off with a visit from the Stanley Cup. As the weekend rolled into Monday, the community put their long and storied hockey history on display at a gala dinner hosted at Hamilton College. With Jeremy Roenick on-hand as the master of ceremonies, the evening was a celebration of Clinton’s connection to the game and a fundraiser for the continued enhancements to the towns’ arena. Hosting an NHL pre-season game is what the Kraft Hockeyville experience is all about and by Tuesday morning, despite torrential downpours, Clinton was bursting at the seams to welcome the Sabres and Blue Jackets to town. Once inside out of the rain, the fans in Clinton were treated to a front row seat to the Sabres and Blue Jackets game-day skates. Both teams put on spirited practices for the fans with speed, skill and excitement. Following the morning skate’s, Josh Anderson and Boone Jenner of the Blue Jackets and Zach Bogosian and Kyle Okposo of the Sabres joined NHLPA Divisional Player Representative, Joe Reekie, and a number of local Clinton minor hockey players in celebrating a donation from NHLPA Goals & Dreams of $10,000 worth of brand new hockey equipment. The donation is part of the Kraft Hockeyville USA 2018 grand prize and a lasting legacy of the players’ participation in the KHV program. With the rain cleared and the community buzzing as the evening arrived, the final piece of the Kraft Hockeyville USA 2018 celebration – the game between the Sabres and the Blue Jackets at the Clinton Arena – was set to get underway. With a packed house on hand, one overwhelmingly partial to the Sabres, the two teams took their skill to this small but historic rink. After a scoreless first period, the Sabres struck first with Casey Nelson giving Buffalo a 1-0 lead at 1:13 of the second period. Columbus tied it when Anthony Duclair broke in alone and made a nice deke to beat Scott Wedgewood. Barely two minutes later, Sam Reinhart, fresh off signing a two-year contract extension, gave the Sabres a 2-1 lead. The Blue Jackets were not done, however, as Adam Clendening would knot things at 2-2 heading into the third period. The Blue Jackets took control in the final frame as Artemi Panarin and Kevin Stenlund both notched power-play goals to lift Columbus to a 4-2 win. As the teams depart and Clinton goes back to a normal, quiet upstate New York town, the community should be proud to have hosted such a successful and fulfilling Kraft Hockeyville USA 2018.